It’s the holiday season, the time when many people indulge their sweet tooths. There are so many opportunities to enjoy sweet treats that it’s hard to pass them all up. During the holidays, it’s perfectly natural to reach for holiday cookies, sweet candy canes, or other holiday favorites. It’s a time to celebrate with family and friends and enjoy a little time for yourself. 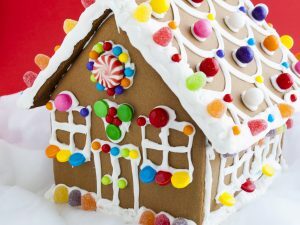 It’s also perfectly okay to have fun and enjoy sugary treats during the holidays — just as long as you don’t overdo it and take special care to protect your teeth from the potentially harmful effects of sugar. Your teeth need to last you your entire life. So taking care of your smile during the holidays is just as important as it is the rest of the year. The last thing you want is to have to spend part of your holiday in a dentist’s chair treating a toothache. When indulging in sweet holiday treats, make sure you brush your teeth more frequently. The longer sugar stays on the surface of your teeth, the more harm it can do to your teeth’s natural enamel. Sugar erodes the protective layer of enamel that sits on the surface of your teeth. Removing any residual sugar with toothpaste and toothbrush can combat the effects of sugar. Sugar can also build up between your teeth, especially if you enjoy crunchy cookies or caramel candies. In addition to brushing after every meal and snack during the holidays, it’s also a good idea to carry dental floss with you so that you can get sugar out from between your teeth as well. Enjoy the holidays and all your favorite sweet treats. But remember to take care of your smile as well.